Rachel | You Cooked What? Any traditional Jewish meal begins with the breaking of bread. Challah or Kitkah is a special kind of bread used for Shabbat and holidays. It is a very sweet, golden, eggy bread. The loaf is usually braided, but on certain holidays it may be made in other shapes. 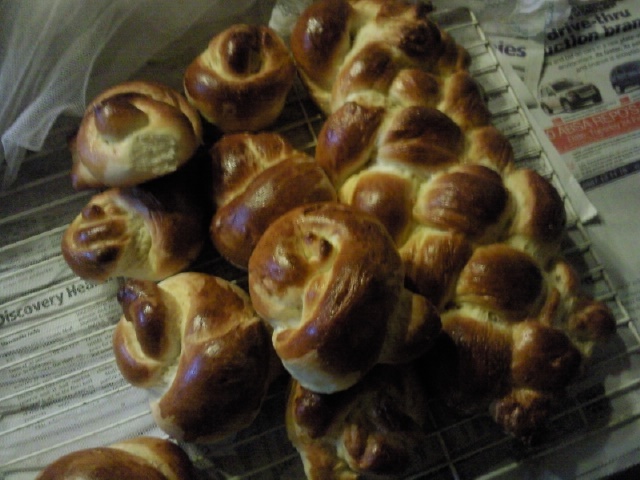 For example, on Rosh Hashanah, it is traditional to serve round challah. Yesterday I made an enormous batch of Challah. I had a great need to punch something and punching dough is also rewarding in the end. I used this recipe from the Yeshiva College recipe book, well actually I doubled it but I won’t be repeating that again any time soon. 4 cups of lukewarm water. Mix half the flour and the rest of the dry ingredients together. Make a well in the centre and add in the liquid. Use a wooden spoon to mix and gradually add in the rest of the flour until you have soft, malleable dough. Knead it well and get that yeast working. Place the dough in an oiled bowl and leave to rise for about 3 hours. Cover the bowl with a towel and leave it in a warm area away from the breeze and curious cats. 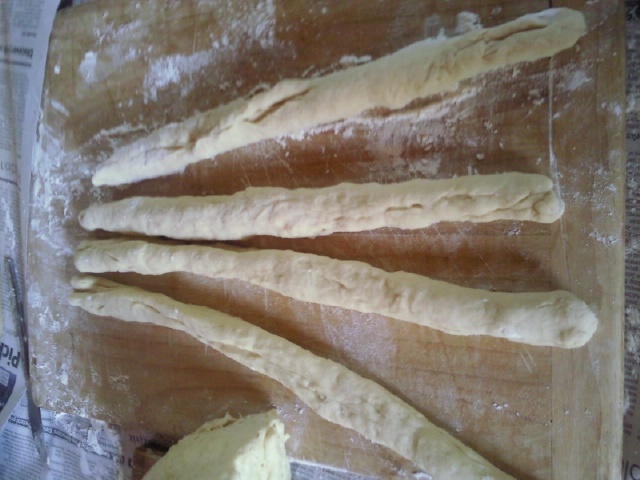 After a while, the dough has grown magically in size and is ready to start punching and braiding. Use a wooden board. Have some flour on hand so that the dough doesn’t get stuck to the board. Punch all the air out and have fun! Now you’re ready to shape and braid the challah. Place on a baking tray and let the dough rise again. After about 20 minutes it can go into the oven at 1800C for 20 minutes or until golden brown.